The European turtle dove (Streptopelia turtur) belongs to the family of doves and pigeons, Columbidae. These dove species are distributed in central and southern European countries, Central Asia, West Asia, the Middle East, North Africa and the Sahel region of Africa. The population size of these European turtle dove species has declined sharply and it is listed as "Vulnerable" by IUCN. There are four recognized subspecies of these doves. The European turtle dove (Streptopelia turtur) is closely related to the dusky turtle dove (Streptopelia lugens), Adamawa turtle dove (Streptopelia hypopyrrha) and Oriental turtle dove (Streptopelia orientalis). 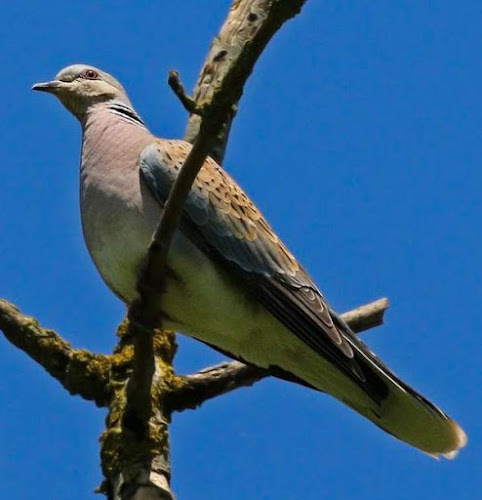 The four recognized subspecies of European turtle dove are: Streptopelia turtur turtur (Linnaeus, 1758), Streptopelia turtur rufescens (C. L. Brehm, 1845), Streptopelia turtur hoggara (Geyr von Schweppenburg, 1916) and Streptopelia turtur arenicola (E. J. O. Hartert, 1894). The European turtle dove (Streptopelia turtur) is a small dove measuring 25 to 30 cm in length and weighing 100 to 170 grams. The wingspan is 45 to 55 cm. The plumage of the upperparts of the European turtle dove is brownish gray. There is black and white striped patch on the sides of the neck. The tail is wedge shaped and has dark center and white borders and tips. The head, neck, flanks, and rump are bluish gray. The wings are cinnamon colored and mottled with black color. The throat region is whitish and the sides of the face are pinkish gray. The lower throat and breast are mauve-pink. The bill is gray and the feet are pink. The eye rim is red and the irises are light yellow. Their call is a characteristic soft, purring, cooing, “rrrhoo..rrhoo” sound. The European turtle dove species are distributed in central and southern European countries, Central Asia, West Asia, the Middle East, North Africa and the Sahel region of Africa. Vagrants occur in Pakistan, India and Maldives. 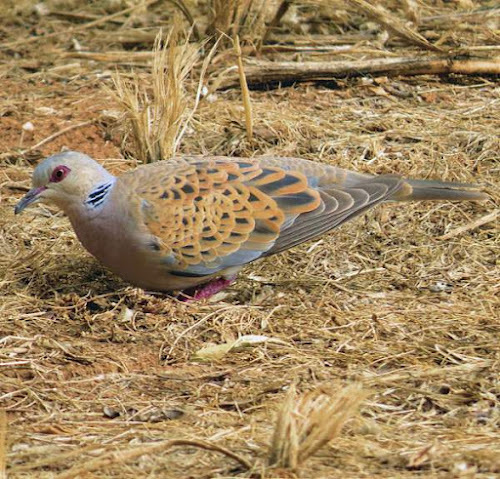 Wintering European turtle dove species are distributed in south Mauritania, Senegal, Gambia, Guinea-Bissau, north Guinea, south Mali, Burkina Faso, south Niger, north Nigeria, north Cameroon, Chad, northern Central African Republic, Sudan, northern South Sudan, central and western Ethiopia and Eritrea. The European turtle dove nominate subspecies S. t. turtur is distributed in the central and southern Europe, north Mediterranean coast, Turkey, Syria, Georgia, Azerbaijan, Kazakhstan and Western Russia and west Siberia. The subspecies S. t. arenicola is distributed in north Africa, Middle East, Afghanistan, Turkmenistan, Uzbekistan, Tajikistan, Kyrgyzstan and northwest China.The subspecies S. t. rufescens is distributed in parts of Nile Valley and Kharga and Faiyum Oases in Egypt. 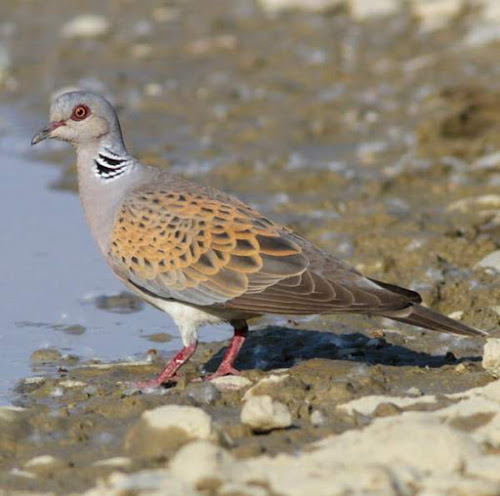 The Important Bird and Biodiversity Areas (IBA) of European turtle dove species in Bulgaria are, Kresna Gorge, Provadiysko-Royaksko plateau and Sakar. The IBA in Czech Republic is Krivoklatsko (Krivoklatsko region). The Important Bird and Biodiversity Areas (IBA) of these doves in Italy is Selva del Lamone. The IBA in Spain are Mountains of Barcelona and the IBA in Ukraine is Samars'kyj forest. 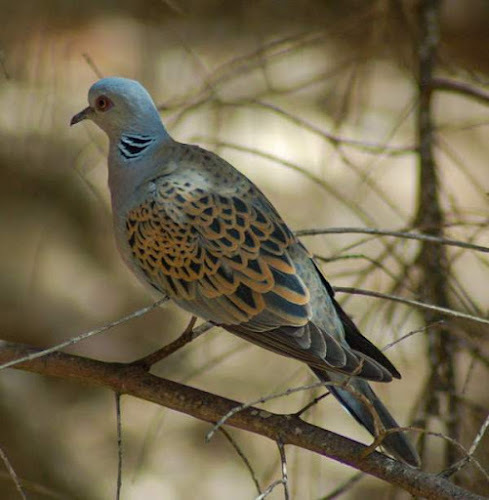 These European turtle dove species are moderately forest dependent. These species occur in altitudes from 0 to 1300 meters. These European turtle dove species inhabit artificial ecosystems like agricultural lands, hedges, trees on the margin of roads, rural gardens, groves, young plantations and degraded forests. The natural ecosystems of these doves includes steppe, semi-deserts, boreal forests, temperate forests, borders of forests, shrubby vegetations, scrubby wasteland, temperate shrublands and woody marshes. The diet of these European dove species is mostly seeds. Wild seeds, berries, fruits, cereal and invertebrates are their primary food. They usually forage on the ground. The breeding season of the European turtle dove starts from the month of May in most of the range. They nest on lowest branches of trees and on shrubs and hedges. The nest is a small platform of twigs and sticks, lined with plant material like grass stems, roots and leaves. The typical clutch of these dove species contains two white oval eggs. The European turtle dove species are strongly migratory birds. Breeding populations of European turtle dove exist in central and southern Europe, Central Asia, the Middle East and North Africa. After raising the young, in September, these birds move southwards for wintering in Sahel region of Africa. Wintering birds are observed in south Mauritania, Senegal, Gambia, Guinea-Bissau, north Guinea, south Mali, Burkina Faso, south Niger, north Nigeria, north Cameroon, Chad, northern Central African Republic, Sudan, northern South Sudan, central and western Ethiopia and Eritrea. These doves move north to their breeding grounds in early summer. Some African populations existing in their southern breeding range may remain resident. 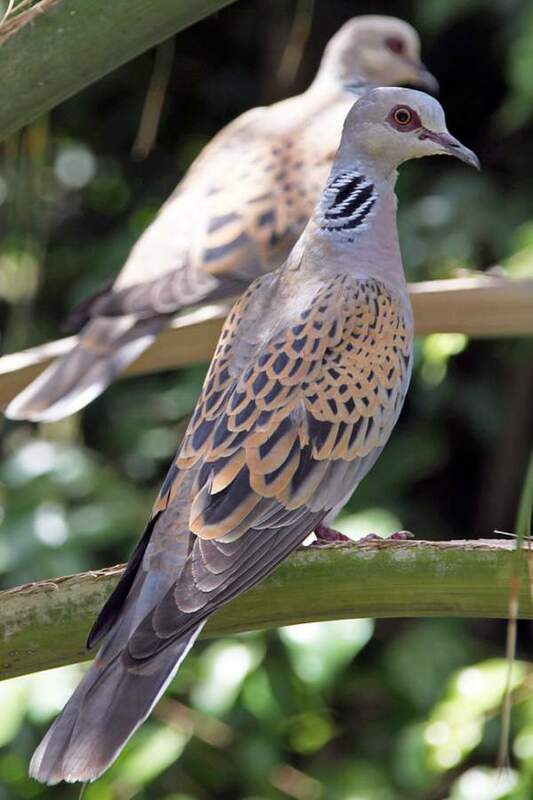 The global population size of the European turtle dove (Streptopelia turtur) is estimated to be around 19,300,000 to 71,400,000 individual birds. The overall population trend of these dove species is considered to be decreasing rapidly. Throughout its range it is reported to be fairly common and numerous. The generation length is 5.3 years. Their distribution size is about 36,000,000 sq.km. 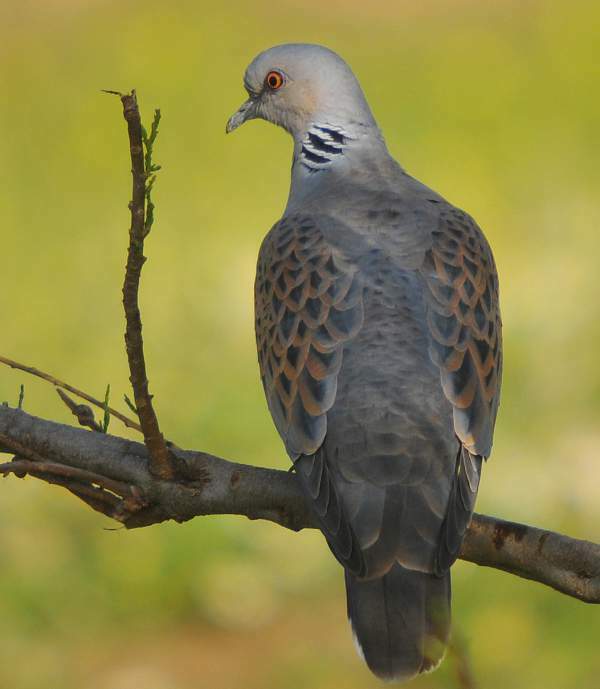 The European turtle dove (Streptopelia turtur) has approached the thresholds for being Vulnerable, under the range size criterion, under the population trend criterion and under the population size criterion. Loss of foraging and breeding habitats and hunting pressure are the main threats that may endanger the survival of these dove species. The IUCN (International Union for Conservation of Nature) has categorized and evaluated the dove species and has listed it as "Vulnerable". CITES (the Convention on International Trade in Endangered Species of Wild Fauna and Flora) status is ‘Not Evaluated’ for the European turtle dove (Streptopelia turtur). 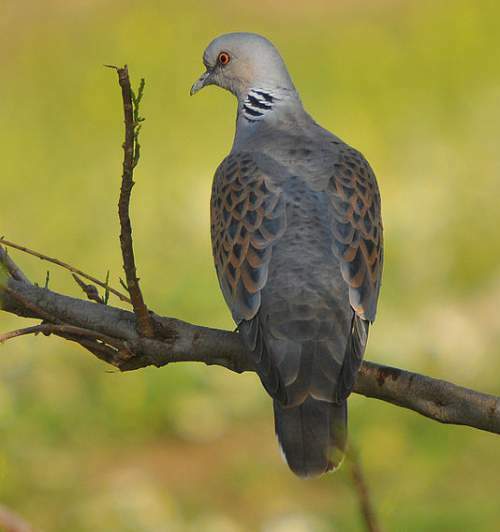 Current topic in Birds of India: European turtle dove - Streptopelia turtur. The lesser crested tern (Thalasseus bengalensis) is a medium-sized bird belonging to the family Laridae. These lesser crested tern species are closely related to Thalasseus maximus, Thalasseus elegans, Sandwich tern (Thalasseus sandvicensis) and Thalasseus bernsteini (Chinese crested tern). Being closely related as well as looking similar has lead to difficulty in differentiating these birds by the amateur birders. 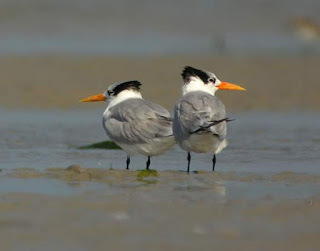 The species Thalasseus maximus, Thalasseus bengalensis and Thalasseus elegans are also known as orange-billed terns. The Thalasseus bengalensis species is close to extinction and its presence is restricted to China and Taiwan. The Thalasseus maximus is a larger bird, with one subspecies T. m. maximus restricted to coastal Americas and another subspecies T. m. albididorsalis occurring in northwest Africa. The T. m. albididorsalis distribution overlaps that of the Thalasseus bengalensis. However, Thalasseus maximus is a very large bird when compared to T. bengalensis and has thicker bill. The Thalasseus elegans is marginally paler than T. bengalensis and has white rump whereas the later has gray rump. Further T. elegans species have longer, slender bill with a different curvature. The Thalasseus sandvicensis has similar gray plumage as T. bengalensis, but the bill is black with yellow tip. 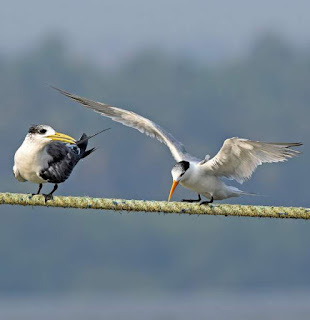 Current topic in Birds of India: Lesser crested tern (Thalasseus bengalensis) photos. 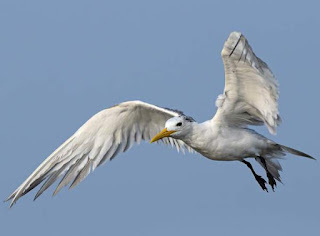 The lesser crested tern (Thalasseus bengalensis) belongs to the family of terns, Sternidae. 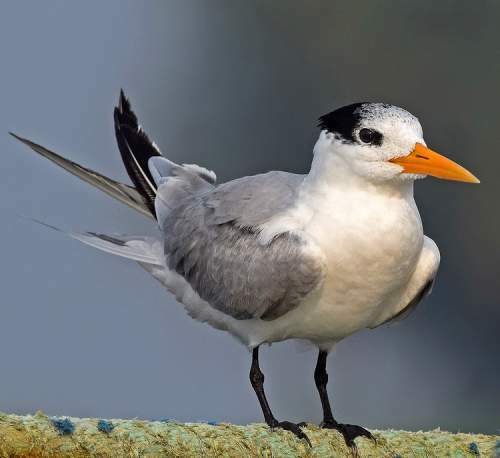 These tern species are distributed in coastal regions of Indian subcontinent, northwest and east African coast, Madagascar, coasts around Bay of Bengal, southeast Asian coasts, northern Australian coast and Papua New Guinea. Genetic data suggests that lesser crested tern is closely related to royal tern (Thalasseus maximus). There are three recognized subspecies of lesser crested tern. 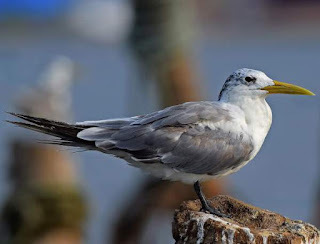 The lesser crested tern (Thalasseus bengalensis) is considered closely related to royal tern (Thalasseus maximus), elegant tern (Thalasseus elegans), Sandwich tern (Thalasseus sandvicensis) and Chinese crested tern (Thalasseus bernsteini). The three recognized subspecies of lesser crested tern are: Thalasseus bengalensis bengalensis (Lesson, 1831), Thalasseus bengalensis emigratus (Neumann, 1934) and Thalasseus bengalensis torresii Gould, 1843. The lesser crested tern (Thalasseus bengalensis) is a medium-sized bird measuring 35 to 45 cm in length and weighing 180 to 240 grams. The wingspan is 90 to 105 cm. The overall plumage of the lesser crested tern is a uniform gray on the upperparts and white on the underparts. 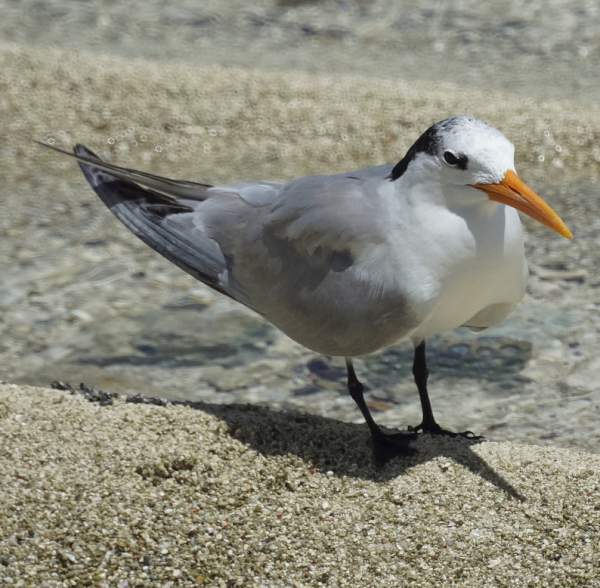 Its characteristic gray rump helps in differentiating from similar looking terns. The breeding tern adult has a black cap and black crest. The upperwings and central tail feathers are grey. The underwings are white with grayish trailing edge. The webbed legs are black. The bill is long and yellowish orange in color. Their call is a characteristic loud grating "kear-ik..kear-ik" sound. The lesser crested tern species are distributed in the coastal regions of Indian subcontinent, northwest and east African coast, Madagascar, coasts around Bay of Bengal, southeast Asian coasts, northern Australian coast and Papua New Guinea. The lesser crested tern nominate subspecies T. b. bengalensis are distributed in the coastal regions and nearby islands in Red Sea, Persian Gulf and Indian Ocean. These subspecies winter in South Africa, Madagascar and Sri Lanka. 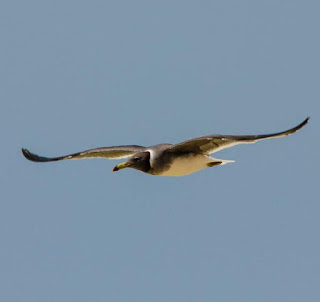 The lesser crested tern subspecies T. b. emigratus are distributed in Libyan coast. The subspecies T. b. torresii is distributed in several Indonesian islands, New Guinea and North Australia. The Important Bird and Biodiversity Areas (IBA) of lesser crested tern in Madagascar are, Wetlands of the Tsiribihina delta and upper Tsiribihina river, Tambohorano Wetland NPA, Ambavanankarana wetland, Baly Bay National Park, Cape Anorontany Archipelago NPA, Mahavavy - Kinkony wetlands NPA and Sahamalaza - Radama Islands National Marine Park. The Important Bird and Biodiversity Areas (IBA) of lesser crested tern in Libya are Geziret Garah and Geziret al Elba - Ayn al Ghazalah Bay. The IBA in Kenya are Sabaki River Mouth and Tana River Delta. 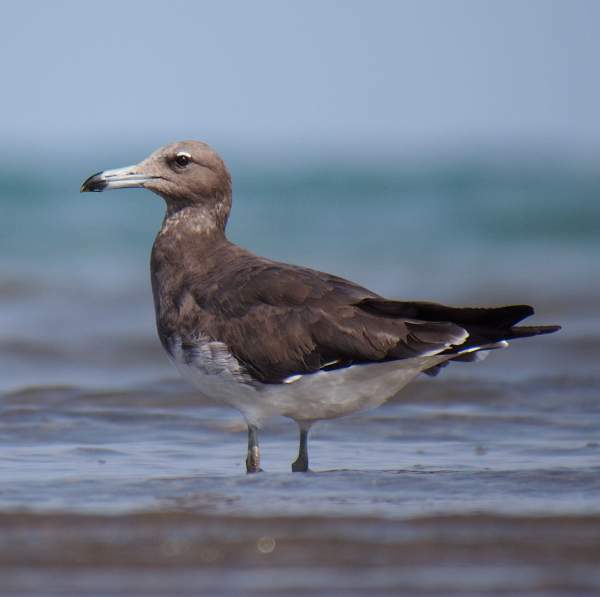 The IBA in Iran are Kharku Wildlife Refuge and Nakhilu, Morghu and Ummal Karam islands. The Important Bird and Biodiversity Areas (IBA) of lesser crested tern in Saudi Arabia are Abu Ali, Gulf coral islands and Gulf of Salwah. The IBA in Tanzania are Dar es Salaam coast, Rufiji Delta and Na Muang Krabi. 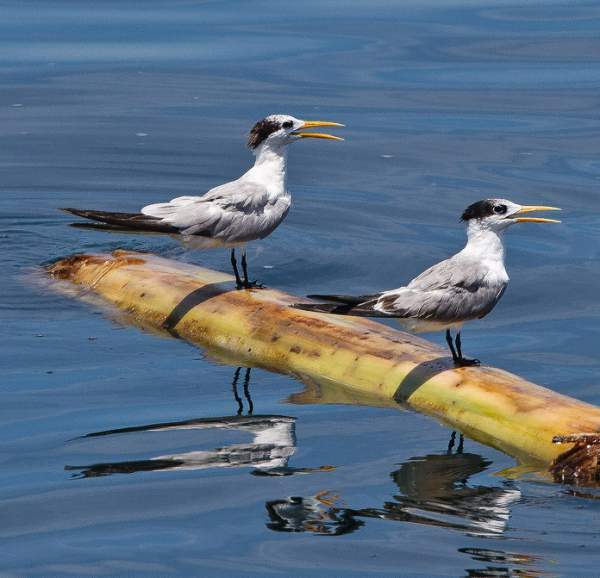 The IBA of these terns in Sudan are Suakin archipelago, Mukawwar island and Dunganab bay. The Important Bird and Biodiversity Areas (IBA) of lesser crested tern in Australia are Brook Islands, Sudbury Reef, Cape York to Cape Grenville Islands, Stapleton Island, Islands North of Port Stewart, South Barnard Islands and Michaelmas Cay. The IBA in Egypt is Hurghada archipelago. These lesser crested tern species do not normally occur in forest. These species occur in altitudes from 0 to 100 meters. These lesser crested tern species inhabit natural ecosystems like offshore islands, intertidal mud flats, rocky, pebbly, shingle and sandy shoreline, beaches, tide pools, lagoons, estuaries, coral reefs and shallow seas with macroalgae like kelp and seagrass. The diet of these lesser crested tern species is mostly fish. Pelagic fish and shrimp are their primary food. They are gregarious while foraging. Foraging flocks of single or mixed-species comprising up to 400 individual birds can be observed. They feed by plunge-diving for fish. 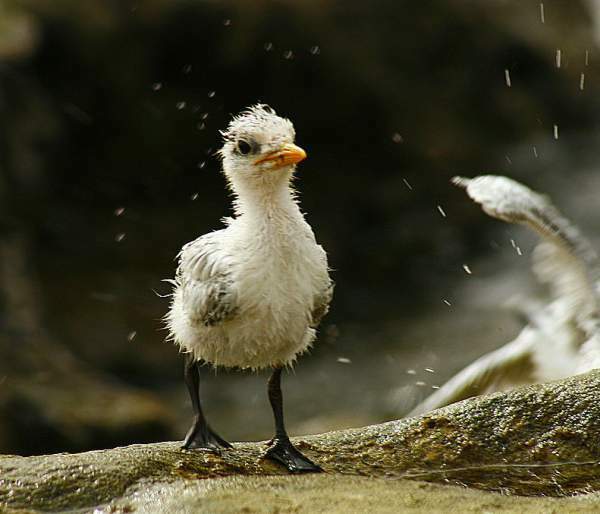 The breeding season of the lesser crested tern is from September to December in Australia. 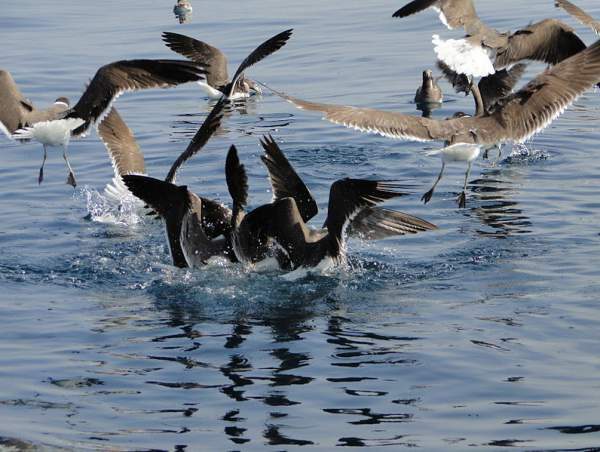 The breeding season is in May and June in Persian Gulf. The laying season is in July and August in Libya. The breeding season in Somalia is in August. These lesser crested tern species are colonial breeders, breedig in dense colonies of even up to 20,000 pairs. 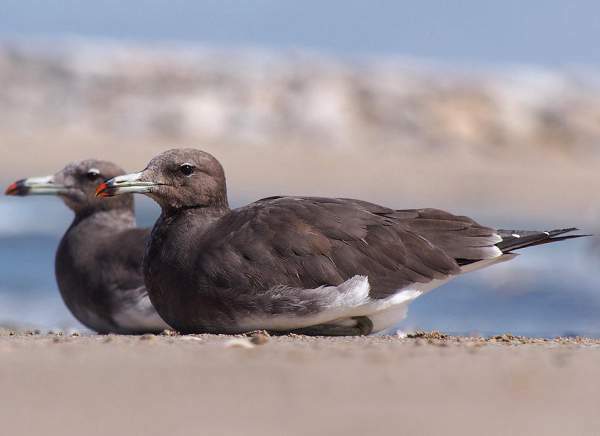 The nesting sites are located on inshore islands, low-lying offshore islands, coral flats, coral islands, sandbanks, inter-reef substrates and flat sandy beaches. The lesser crested tern nest is a shallow scrape surrounded by vegetation. One to three spotted eggs are laid. The closeness of nests provides them protection from predators. 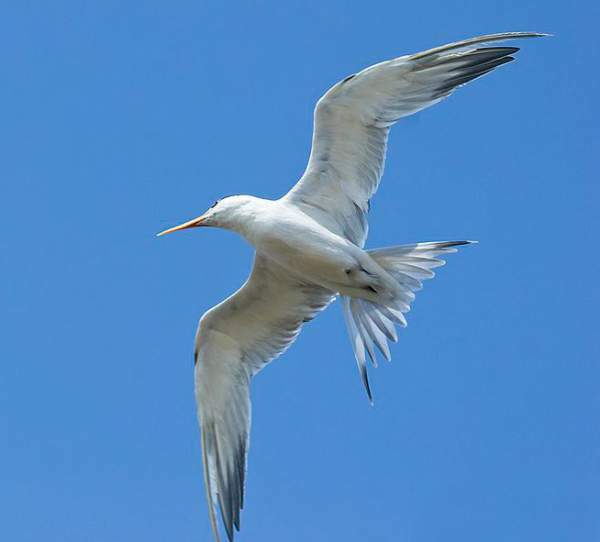 The lesser crested tern species are partially migratory birds. There is inadequate information available about the movement patterns of these lesser crested tern species. Some northern populations in Africa and Middle East appear to move southwards for wintering at the end of the breeding season. The populations in Australia appear to be sedentary. Post breeding, the tern juveniles may disperse and establish in new locations within the range. They sometimes may make local movements for feeding and breeding within their range. The global population size of the lesser crested tern (Thalasseus bengalensis) has not been quantified. The overall population trend of these tern species is considered to be stable. Throughout its range it is reported to be common to uncommon. The generation length is 11 years. Their distribution size is about 41,500,000 sq.km. 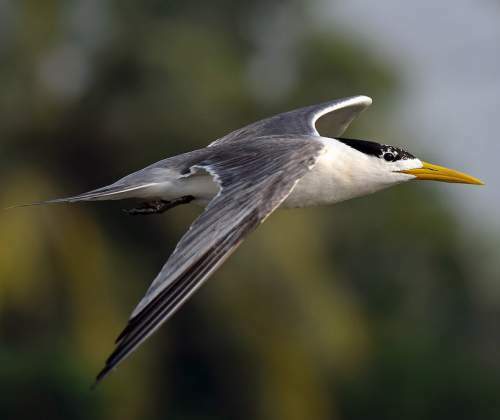 The lesser crested tern (Thalasseus bengalensis) does not approach the thresholds for being Vulnerable, either under the range size criterion, or under the population trend criterion or under the population size criterion. Oil exploration activity and oil spills are the main threats that may endanger the survival of these tern species. The IUCN (International Union for Conservation of Nature) has categorized and evaluated the tern species and has listed it as of "Least Concern". CITES (the Convention on International Trade in Endangered Species of Wild Fauna and Flora) status is ‘Not Evaluated’ for the lesser crested tern (Thalasseus bengalensis). Current topic in Birds of India: Lesser crested tern - Thalasseus bengalensis. The sooty gull (Larus hemprichii) is classified under family Laridae under the order Charadriiformes. The sooty gull species are distributed in the coasts and inshore islands of Red Sea, the Gulf of Aden, the Gulf of Oman and the Persian Gulf. Towards east, the distribution extends to Iranian coast and Pakistani coast. Southwards, they occur along the east coast of Africa as far south as Mozambique. 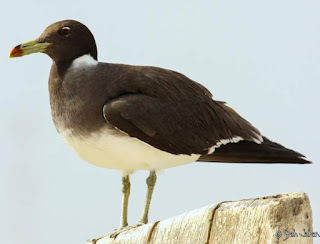 The sooty gull species occurs as a vagrant in India, Jordan, Lebanon, Israel and Bahrain. Its occurrence is recorded far away from the native range, in countries such as Sri Lanka and the Maldives. These coastal bird species, though seldom go far from coastline and coastal reefs, have occasionally been seen 140 km away from the land. 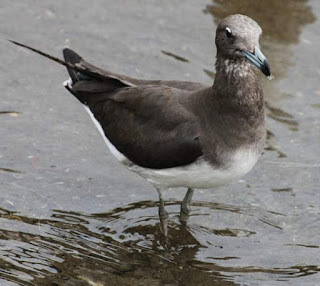 The sooty gull species inhabit subtropical and tropical mangrove growth, intertidal mudflats, tide pools, estuaries and creeks. They also inhabit rocky, sandy, pebbly and shingle shoreline and beaches, coral reefs, inter-reef land and lagoonal and subtidal regions. They forage in ports and harbours, the coastline, inshore islands, coral reefs and the intertidal zone. These species have been evaluated by IUCN (International Union for Conservation of Nature) and currently listed as "Least Concern". There is slow and steady decline in the total population size. The ongoing oil exploration activities, land reclamation for residential and commercial purposes and the possibility of oil spills are the imminent threats for the survival of these species. 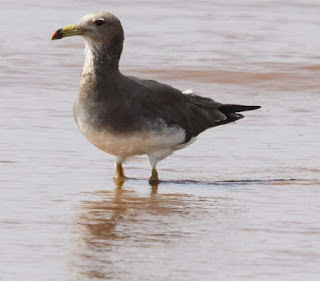 Current topic in Birds of India: Sooty gull (Larus hemprichii) Photos.